The Bobbilicious Files: My Picnic Blanket Skirt! 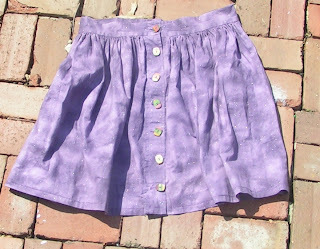 Last summer the wonderful Tilly put up a tutorial for her Picnic Blanket Skirt. I bookmarked it, thinking I'd get to it eventually because it's super cute. Recently when I was going through my fabric for some reason I found a piece that I knew would be great for it...so I made one! I used a light-medium weight cotton that's covered in sparkles. It was pretty easy to sew up - it's all rectangles. I did have some trouble with the buttonholes, but then, I usually have trouble with buttonholes. I would up doing them by hand. They aren't great but they work. The buttons are from Knit Picks and are the same wood that's used for the Harmony knitting needles that I love so much. (I have a big love for anything that's made with the multicolored wood, though) I had a small, brief worry about a gathered skirt on a big backside, but then I decided that it would be like a bustle and just accentuate what's there. I plan to make at least one more of these. It was super comfortable yesterday and I got several compliments on it. 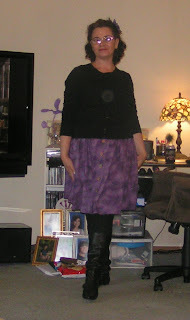 I had to wear tights and boots, though, because it was raining...big surprise. Many of the towns around here have been evacuated because the river is so high - the predictions are for the worst flood in decades. Our basement started to flood a bit but I used a push broom to direct the water towards the sump pump. It's not exactly how I like to spend a day but it's so much better than cleaning up after several inches of water have ruined things. I have some sewing questions and don't know where to get answers, so if you can help please do. I'm very curious about linings. What should be lined? How do you do it? What kinds of fabrics are best for using as a lining? Is a lining better than a slip? I see so many beautiful garments on blogs that are lined in various ways and would love to know more. The few books that I have don't really talk about it. Any knowledge that you could share would be greatly appreciated.